The Dutch Quilon as it was called, used to be a British Enclave. The place is also popular as Thangasseri. 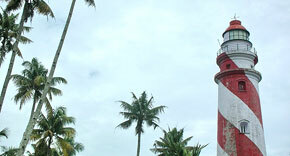 The lighthouse built at Quilon by the British in the year 1902 is visible as far as 13 miles in the sea. The lighthouse stands to an amazing height of 144 feet. The picturesque view of the sea from the place where the lighthouse stands is breathtaking. In the vicinity lies the Portuguese Fort. The fort was built in the year 1517 and at present only a wall of the fort has escaped the assaults made by Time. The Ashtamudi Lake, so named because of its eight 'arms' or channels is the gateway to the backwaters. 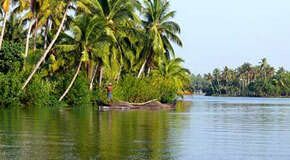 Located in Kollam district, Ashtamudi is famed for its panoramic for its magnificent views. The serene Ashtamudi Lake is a great place to hanker for in the Kollam district. The house boat trips here are great pleasures and so is the boat cruise. The boat cruise to Munroe Islands is a wonderful experience. Sasthamkotta is largest freshwater lake in Kerala and is surrounded by hills on three sides except on the south side, where a bund has been constructed separating the lake from the neighboring rice fields. The ancient Sastha Temple which lends its name to the town, is an important pilgrim centre. A large part of the lake has been reclaimed for agriculture. The source of water is from the underground sprouts. Accommodation is available at the PWD Rest House. Palaruvi Falls are located around 35 kms from Punalur in the Kollam District of Kerala. 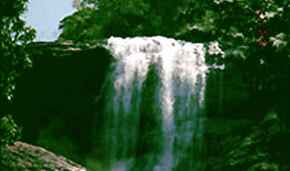 The Falls are located in a place which is called the Gateway of Backwaters of Kerala. Palaruvi which means "milky stream" makes its `milky way down the rocks, falling from a height of 300 feet. The Palaruvi woods is a beautiful picnic spot. There are frequent buses to Ariankavu from Kollam. The PWD Inspection Bungalow and the KTDC Motel offer comfortable accommodation. Thenmala is a very popular tourist place near Punalur in Kollam district. India's first eco tourism project is located at Thenmala. Thenmala is located about 72 kms from Thiruvananthapuram. This is a predominantly forest area in the Western Ghats. Shenduruney Wildlife Sanctuary is one of the major attractions of this place. Other places of tourist importance are Thenmala Dam, Palaruvi, the adventure zones etc.